The base V6 Camaro coupe lives in the media shadow of its LS1 Z28 brother, and that's unfortunate because the V6 Camaro is a great performance car in its own right. From its 200-hp engine to its large 4-wheel anti-lock disc brakes, the lesser Camaro can keep up with any 2-valve Mustang GT and can run circles around import performers. Chevrolet is modest about its V6 coupe; there are no huge ad campaigns, no big media parties, and no hoopla about big horsepower in the media or sales literature. It's just there, the diamond in the rough waiting to be discovered. Unfortunately, GM's zero-advertising "build it and they will come" strategy hasn't worked. Sales are down and the big-wigs are getting frumpy. Could we be witnessing the last days of the rear-wheel-drive Camaro? If so, they can only blame themselves because this is one hot performer. 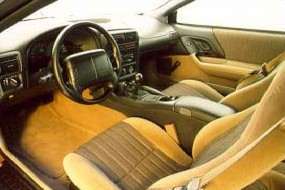 Our Sport Gold Metallic test model was equipped with the base 200-horsepower 3800 Series II V6 engine, 5-speed manual transmission, 4-wheel anti-lock disc brakes, tilt steering column, air conditioning, AM/FM cassette 4-speaker sound system, dual airbags, P215/60R16 radials, intermittent wipers and remote hatch release. For an additional $2,200 over base price, our tester had cruise control, foglamps, power door locks, removable T-roof panels, keyless entry, rear window defogger, N.Y. emissions package, body-side molding and rear floor mats. For some strange reason, power windows and mirrors were not part of our press vehicle, conveniences we missed dearly in the two weeks we had the Camaro. Realistically, when you figure in the $750 rebate (offered right on the window sticker) and your dealer's best price, a well-optioned V6 should go for around $16,000. As you read this at the model year close-out, you'll likely do even better than this because dealers will be making way for the '99s, which we understand will be virtually identical to the '98s. For 1998, the Camaro's front fascia has been updated (see "Cruise Missile," May '98), and the Delco anti-lock brake system has been scratched in favor of a new Bosch system that uses a smoother active proportioning scheme. All Camaros receive larger brakes for 1998; 12-inch vented rotors are standard on both the V6 coupe and the Z28, meaning essentially that the V6 gets Z28 stopping power free. The 200-hp 3800 Series II V6 has been in the Camaro since the last half of the 1995 model year. The simple pushrod V6 has one primary advantage over more sophisticated multivalve engines: displacement. With less output per cubic inch, the 9.4:1-compression V6 is the model of reliability. Even with more cubes, the 3800 sips gas to the tune of 30 mpg on the highway, thanks to its top-shelf DIS and Delco engine management. Compared with previous LT1-powered F-bodies we've driven, the V6's big brakes were noticeably better. (Autocrossing, anyone?) One major shortcoming was the small tire, which activated the threshold of the ABS a little too early for our tastes. We suggest you check the box for the Y87 performance handling package, which includes the Z28's larger 235/55R16 tires and aluminum alloy wheels. This "must have" package also includes a sport steering ratio (14.4:1 vs. the regular 16.9:1), dual exhaust tips and a limited-slip rear (all 5-speeds keep the 3.23 gears; automatics are upgraded to 3.42 gears from 3.08). During the Camaro's stay at GMHTP, we had the opportunity to drive the V6 on several twisty switchbacks. The big Z28 stoppers inspired us to brake late going into corners, but turn-in was dicey due to the small tire contact patch. 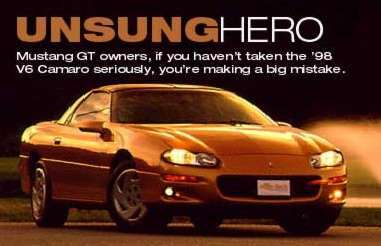 However, unlike driving an SN95 Mustang in similar situations, the Camaro's low center of gravity made the edge of control much more predictable. If you regularly read the reviews of import performance cars, you could be forgiven for thinking the latest Japanese or German micro motor is the greatest thing since sliced bread. High-revving multi-valve DOHC engines the size of your morning cup of coffee zing out 150, 175 or even 200 hp. 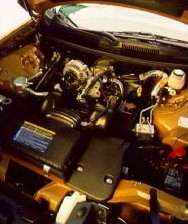 Ironically, these engines are more suited to the title of "high-tech" than the Camaro's 3800 Series II V6 pushrod motor, but we wouldn't exactly call the Camaro's distributorless, sequential fuel-injected, dual-electronic-spark-control V6 a low-tech motor, either. At the drag strip, the Camaro's pushrod V6 really shined. A let's-get-acquainted 15.23/89.5 was followed by a 15.37/90.3, 15.41/89.8 and a 15.47/89.2, with the engine getting successively hotter from being hot-lapped. With the air filter out and the serpentine belt off, the V6 responded after a cooldown with a 15.03/91.0 and a 15.15/90.3. We did notice that above 4000 rpm the exhaust sounded noticeably restrictive; this leads us to believe that major gains in horsepower--perhaps as much as 10 percent--could be made with just a larger catback exhaust. This would put our test Camaro in the 14s without removing the air filter or belt. Still, we think low 15s going through in third gear with an open rear and a small radial tire is absolutely fabulous given the Camaro's budget status. Give the V6 some gear, a catback exhaust, a small pair of slicks and a 10-minute tune-up and this budget bomber can knock down modular-motored Mustang GTs all day long. And while some diehard Ford fans are perfectly welcome to argue with this biased opinion, we already know of at least one automatic V6 F-body that is running 12.80s in NHRA Stock Eliminator. If you're looking for a performance car--domestic or import--and you're on a budget, the V6 Camaro is perfect. Great looks, super all-around performance, autocross potential, numerous available aftermarket speed parts and rear-wheel drive make the V6 Camaro an obvious choice. Article courtesy of GM High Tech Performance magazine. � 2001-2005 FirebirdV6.com/CamaroV6.com. All rights reserved.